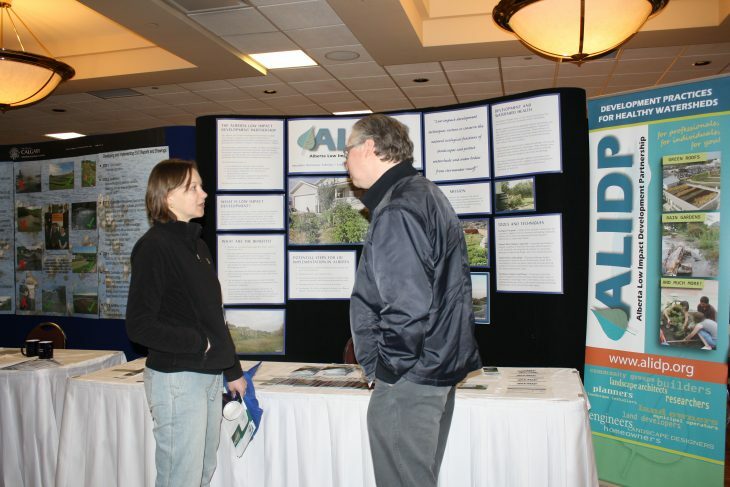 In the fall of 2004, the Alberta Lake Management Society (ALMS) held its annual conference in Okotoks entitled Smart Development: Protecting our Lakes and Watersheds Through Low Impact Development. ALMS invited Kim Stephens from B.C. and Tom Holz from Washington to talk about their experiences with sustainable drainage practices. A pre-meeting was convened at Alberta Environment's offices in order to hear what had been learned so far in B.C. Following the conference, a dedicated group of professionals continued to meet on a regular basis to discuss issues of mutual interest. It became apparent that a lot of effort would be necessary to break down silos, but that it would be imperative to do so, because better water management would not occur otherwise. The stage was set. "More than 160 engineers, developers, politicians, municipalities, biologists, researchers and stewardship groups gathered at the spectacular Cochrane RancheHouse to learn more about LID methods and real-life applications of this ecosystem-based approach to land development, which helps to ensure stormwater runoff and the negative impacts on the landscape and watersheds are controlled through better community planning and site designs. In the end, attendees’ responses indicated that the conference had been exceedingly worthwhile. The conference offered interactive workshops and presentations, covering a wide range of topics targeted towards LID application that could be applied not only within the Town of Cochrane, but for all of Western Canada. “The intent of the conference was to provide opportunities for planners, developers, town councils, policy makers and other attendees to gain a better understanding of LID concepts and successful real-life initiatives. The timing of the conference was set to help address the rapid urban growth in the Calgary region. The Bow River is under increasing water quality and quantity pressures from development throughout the basin. LID has emerged as a strategy that can be shared among all municipalities to reduce their development impacts. Cochrane, in particular, has an opportunity to benefit from the LID conference information and access to experts in determining how it wants to plan and design several new developments on recently annexed land. LID information will also assist the Town as it undertakes a review of its Municipal Development Plan, which will set the future direction of how Cochrane will address current and future development." The unofficial 'Alberta Low Impact Development Partnership' (ALIDP) was meeting on a monthly basis and developed a program for a conference in Edmonton. It was at this event that the ALIDP elected a seven-person board of directors and formed a Society. In August of 2008, the Alberta Low Impact Development Partnership Society was registered under the Alberta Societies Act. The ALIDP's first coordinator, Kim Kiel, was hired part-time. Kim had little time to get up-to-speed before another conference in Cochrane was held in the fall of 2008. 2009 - Edmonton LID - Yes We Can! In the summer of 2009, Leta van Duin began as Coordinator. The board gradually started to move from being a working board to becoming a policy-governing board. A one-day conference was held in Edmonton in the fall of 2009, again strongly attended by more than 90 professionals. From 2010 to 2015, the ALIDP partnered with the City of Calgary to deliver an array of training offerings. Since then the ALIDP has taken the lead to make educational events happen and has partnered widely to deliver events across the province. From Coaldale near Lethbridge in the south, to Olds College in the middle, and Grande Prairie in the north, the ALIDP has been to communities large and small. Conferences with partners like the Canadian Water Resources Association Alberta Branch and Canada Mortgage & Housing Corporation.